AAAF are calling for writers and anyone with a story to tell! 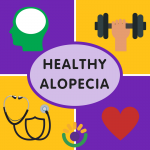 Our blog, Love, Alopecia, is seeking stories about any aspect of health and wellness from people living with Alopecia Areata. We’re giving funds towards improving the health and wellness of our community. Share your #HealthyAlopecia story with us and you’ll go in the running to be one of 12 lucky winners who will receive $2000 towards a healthier you. We’ll be drawing one winner a month over the next twelve months of our Healthy Alopecia theme. You can absolutely write multiple stories to enter your name more than once! Terms and conditions do apply, so visit the blog for all the details in how you can get involved in this fantastic program. The blog competition is one of our major projects under our theme of #HealthyAlopecia.